Heading to the coast this weekend? Then grab this beach bag from Gap before you go. It's only £2.99 in the sale, reduced from £7.50. 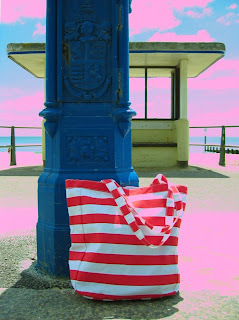 I do love a good stripe and this bold, cheerful tote is perfect for the seaside. Plus, it's on the generous size, so there's bags of room for all your beach needs (towel, sun cream, water, magazines...). Made of thick sturdy cotton, it's also handy as a shopping bag. And it comes in a more sophisticated palette of grey and white, too.